Today we saw a lot of the workaday side of England. We spent a large chunk of the day working our way through small cities, suburban sprawl, arterial roads, and convenience stores. Navigation was slow at times, and it was late in the day when we finally broke free and climbed out of the developed valleys and struck out for Slaidburn. Around 8:15 we were still a couple of miles below Slaidburn when we came upon a pub that was still serving dinner until 9:00. Jodi and I decided to stop and eat here, and about ten minutes later Duane and Adele showed up. 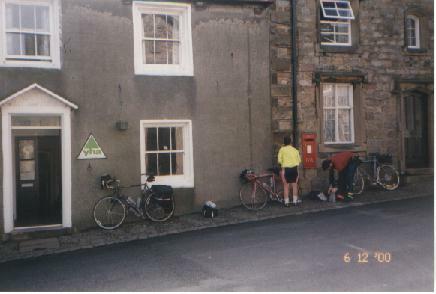 We left there around ten and rode the final push into Slaidburn in the last of the twilight. No one had seen Ed since leaving Chester this morning. We were a bit concerned, but figured he had run out of gas and was holed up in a hotel somewhere along the way. Not so! Ed rode on into the night, and eventually showed up around half past midnight. And still in good spirits to boot!